You'll be £25.00 closer to your next £10.00 credit when you purchase Snipers at War. What's this? Snipers at War is a detailed history and analysis of the equipment, tactics and personalities of the ‘sniping world’, from the pursuit of accuracy to the latest electronic aids to observation and ranging. Technology and marksmanship from the Crimean War to the present day is examined in detail. The role of the sniper was largely ignored until the Winter War of 1939-40 between Finland and the USSR showed what could be achieved by specialist marksmen: Finn Simo Häyhä amassed 505 kills in less than a hundred days, a lesson learned by the Red Army to its cost. By the Germans' invasion of 1941 the Russians were prepared: when the war ended, in addition to men such as Vasiliy Zaytsev, a Stalingrad hero with 242 accredited kills, the USSR had trained more than 2000 women as snipers. After 1945, the sniper’s reputation declined again. However, the Vietnam War, seemingly unending Middle Eastern conflict, internal strife in Sri Lanka, and ever-present urban threats have given new impetus not only to sniping but also to the development of new and more effective weaponry. The book has plenty of good quality photographs throughout to illustrate the kit and personnel involved. All in all, it is a beautifully produced, impeccably researched study of the subject by someone who definitely knows what he's talking about, with enough detail to interest the knowledgeable while still being accessible to the interested. Highly recommended. This book is a thorough and scholarly history of the sniper. It is well written with many useful examples. It is also a veritable treasure trove of technical data on the craft of a sniper. Well worth adding to the library. There have been many books written about military sniping, ranging from the 'okay' to very good. This work, however, is different. In one word it is 'brilliant'. This is written by a shooter who knows his stuff and it is aimed at a readership who know their stuff also. After a background introduction, which is fascinating on its own, the author settles down to cover aspects and present them with supporting ballistic details, which would do a forensic scientist proud. Anecdotes, first-hand accounts, history of firearms and individual snipers, it's all here and it's great. The section on WWI is highly informative and the standard is maintained throughout the book which comes right up to date. This book is never dull. Indeed, if you are going to have one book on sniping, this is it. The stated aim of this book was to collate information about a well-known subject and present it in a form that would have broad appeal. It has succeeded. 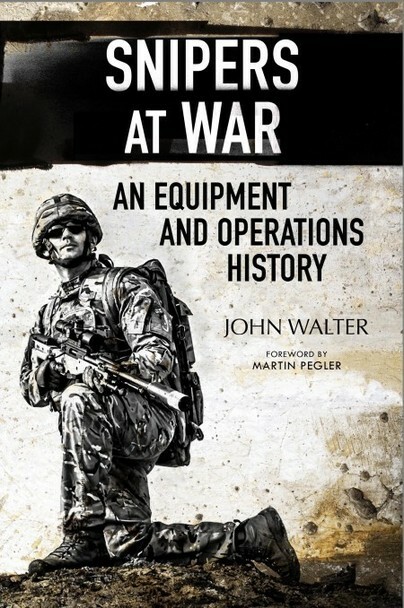 This is a nicely balanced history of the art of sniping detailing the equipment and operations. The sniper has grown in importance over the years, from a handful of good shots in the early days of firearms to the highly polished and considerably more numerous sniper teams of today. – much recommended. ★★★★ If you are looking for a general, well written book about sniping history to present day and the development of sniping weapons look no further. The amount of details are impressive, but for the unseasoned reader they may be overwhelming at times. Given the extend of the subject you would expect few details of the snipers involved. This book includes many personal experiences which makes it an interesting book to read, I would however have loved to read more of these stories though. If you are interested in the subject in detail (including calibre used), manufacturers, you’ve got the right book. Also, if you are interested in ‘story telling’ you may like the book as well. John Walker must have done massive research in order to be able to write this book. For this reason a five star rating would have been well deserved. Often, I read a personal story and wanted to read more about the person but then the story stopped. Since I would have liked to read more of these stories, I’ll rate the book with four stars only, but other readers may believe five stars would be fair.